CAUTION: These sets contain many small pieces and are not suitable for children three years of age or younger or for small children who put things in their mouth. These villages are similar to those made in Germany during the nineteenth century and then exported, especially to Great Britain and the United States. The villages come in two sets. The first set on the right in the picture (labelled Village I in the price list) has four large (at least large in comparison to the other village) houses, each almost two inches wide (country farm houses? ), four pieces of wall, three bushy deciduous trees, two conifers, two horses, and eight people. The people are especially tiny, each being slender and only an inch high. 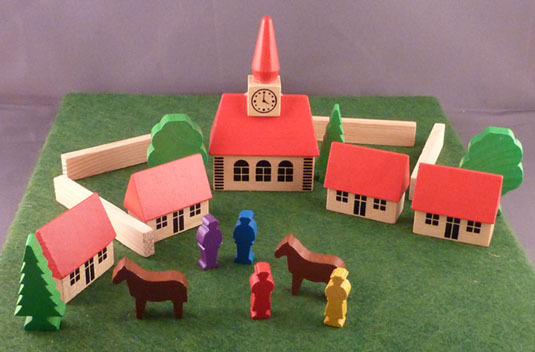 The other set on the left (labelled Village II in the price list) includes a town hall (counting the spire on the hall, about 3 1/2 inches tall), four houses each about 1 1/2 inches long, four pieces of wall each about 2 3/4 inches long, two bushy deciduous trees, two conifers, two horses, and four people. Like the other village, the people are especially tiny, each being slender and only an inch high. 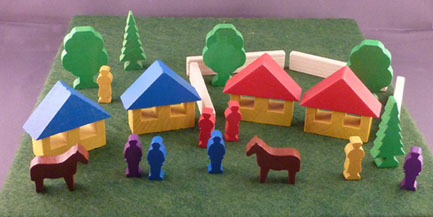 And we're sorry but the villages do not include the green felt "grass" for the village. That is only for display purposes but a piece of green felt can be purchased at many fabric stores.